"It strikes Werner just then as wondrously futile to build splendid buildings, to make music, to sing songs, to print huge books full of colourful birds in the face of this seismic, engulfing indifference of the world- what pretensions humans have!" Anthony Doerr's novel is beautifully conceived and heart breaking. He traces the stories of Marie and Werner, two adolescents whose lives are irrevocably altered by the outbreak of the Second World War. 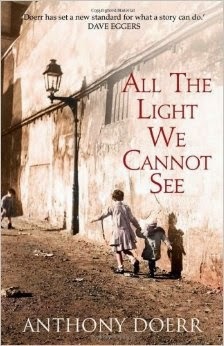 Marie-Laure lives in Paris with her father before the war, taught to navigate the streets of the city by her father's scale model, in the face of the onset of blindness. When war breaks out, the pair flee to Saint-Malo to stay with her father's Uncle Etienne, a man deeply troubled by his past traumas. Werner is an orphan growing up in Germany with his sister Jutta. His fascination with science and the mechanics of the radio eventually lead him to an elite Nazi school, where he must balance his passion with the unfathomable realities of the survival of the fittest mentality. Doerr's story evolves in short chapters, so the reader never loses sight of either of the primary characters. The writing is precise and beautiful, with brutality often conveyed powerfully through the absence of direct description, as in the case of Frederick's disappearance from school, letting the reader, and in this case Werner, fill in the gaps with their imagination. "A single bed with blood in it. Blood on the pillow and on the sheets and even on the enameled metal of the bed frame. Pink rags in a basin. Half-unrolled bandage on the floor." As the much anticipated convergence of the two stories happens, readers are provided with a poignant conclusion which reveals the power of love in the face of all. As the title of the novel suggests, there is much which is unseen, but present, including the strength of character Werner has been struggling to embrace throughout the story. The end result is incredibly moving. "So how children, does the brain, which lives without a spark of light, build for us a world full of light?"